As Dignity funeral directors we are constantly striving to set the bar for high standards in funeral care. We care deeply about every member of our community, and we feel a duty to support you all in arranging a special farewell for your loved one. 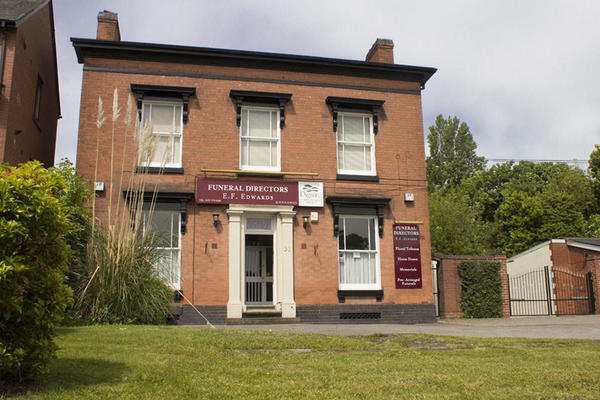 E F Edwards Funeral Directors have been providing funeral services from our Erdington funeral home since 1966. During this time we have built up a wealth of knowledge and experience which we will use to assist you in planning the service. We have local contacts in the Birmingham area, which helps us to make sure that everything on the day is exactly as you want it to be. As well as the funeral service, your wellbeing is equally important to us. We know how difficult the loss of a loved one can be, and we want to offer you our support. You are not alone, and we are happy to be that friendly face you might need. Call us at any time of the day, and we will be here for you. Call us today on 0121 373 0300 to talk through your personal requirements. At E F Edwards Funeral Directors, we understand how special life is with those that you love. For us, every funeral is unique and personal. We have a service to fulfil every wish, with every detail carried out with the same uncompromising quality of care. From a traditional service, to a colourful woodland burial, your options are limitless with our Full Service Funeral. If you have a little more flexibility when it comes to arrangements, then we can provide a Simple Funeral for a lower cost. There is parking to the front of the building. You do not need to call in advance. We are located opposite SS Mary & John Catholic Primary School and St Mary & Johns Church. Our staff are available 24 hours a day on 0121 373 0300 if you require our services outside of these hours. Arrangements for my mother’s funeral at Sutton Coldfield Crematorium were organised in a professional manner. We wanted a Hunanist service and the Celebrant Edwards recommended was good to work with. He delivered an excellent eulogy and conducted the sevice in a sympathetic and professional manner. All the staff performed their duties with respect. I would like to thank you for your 5* rating and comments. We are happy to hear that you were pleased with the services provided by the funeral director and found them to be very helpful caring and supportive. Thank you once again for your review. I would five a rating of five stars for the funeral services provided by E F Edwards for a family member. All the staff at the office were very understanding and efficient. On the day the Funeral Director carried out all requested and helped ease the burden. Excellent service, nothing they could not help with, wounderful people. Catherine very pleasant always ready to help, and Steve couldn’t do enough for my Sister and myself. Would certainly recommend this Funeral Directors. Thank you so much to E F Edwards. E.F.Edwards listened to my wishes for my father's funeral and carried them out with dignity and professionalism. They kept me updated every step of the way and helped with advice when i needed it.